The therapeutic activities of Andrographis paniculata are attributed to four major active diterpenoids: andrographolide (AP1), 14-deoxy-11,12-didehydroandrographolide (AP3), neoandrographolide (AP4), and 14-deoxyandrographolide (AP6). This study aims to quantify the four active diterpenoids in various plant organs of A. paniculata at different growth stages in greenhouse and field experiments, with a developed HPLC-diode array detector (HPLC-DAD) method for simultaneous determination of these diterpenoids. Plants were grown in greenhouse and in field conditions, harvested at different growth stages, and separated into different organs for determination of the four active diterpenoids by an HPLC-DAD method. The most abundant diterpenoid was AP6 between seedling and vegetative stages in the greenhouse experiment (13.38 to 23.71 mg/g in 2006 and 10.67 to 24.54 mg/g in 2007). High levels of AP6 were also detected in leaves at the transfer stage in the greenhouse experiment (36.05 ± 0.69 mg/g) and field experiment (30.59 ± 1.39 mg/g). The levels of AP6 then decreased as plants matured. The highest content of AP4 was in cotyledons (16.65 ± 4.48 mg/g) at the transfer stage. The highest contents of AP1 were detected in leaves at seed-forming stage in greenhouse experiment (24.72 ± 1.89 mg/g) and vegetative stage in field experiment (43.16 ± 0.92 mg/g). Flowers of A. paniculata contained high levels of AP1 (21.42 ± 3.74 mg/g). AP3 and AP4 were at low levels in leaves at all growth stages. In A. paniculata, AP6 was at the highest level in leaves at transfer stage in both greenhouse and field experiments. AP1 was at the highest level in leaves at vegetative stage and seed-forming stage in field and greenhouse experiments, respectively. The contents of AP3 and AP4 in leaves were low at all growth stages. Andrographis paniculata (Burm.f.) Nees, (Acanthaceae) (known as Chuanxinlian in China) is used in Scandinavian and Asian countries to treat the common cold, fever, and diarrhea . The aerial part of A. paniculata is used in traditional Chinese medicine . A. paniculata is beneficial to the liver, immune system, respiratory system, and cardiovascular system, and shows anti-inflammatory, antimalarial, antidiarrheal, hypoglycemic, anti-fertility, anticancer, and anti-HIV activities [1–4]. These therapeutic activities of A. paniculata are attributed to four active diterpenoids; andrographolide (AP1), 14-deoxy-11,12-didehydroandrographolide (AP3), neoandrographolide (AP4), and 14-deoxyandrographolide (AP6) [1–4], which exhibit different pharmacological activities [2, 4]. AP1 showed anti-inflammatory  and anticancer activities with stronger effects on diverse cancer cells than AP3 and AP6. It also showed cardioprotective properties [7, 8]. Our previous studies indicated that AP3 had a potent hypotensive effect  and higher anti-platelet activity than AP1. 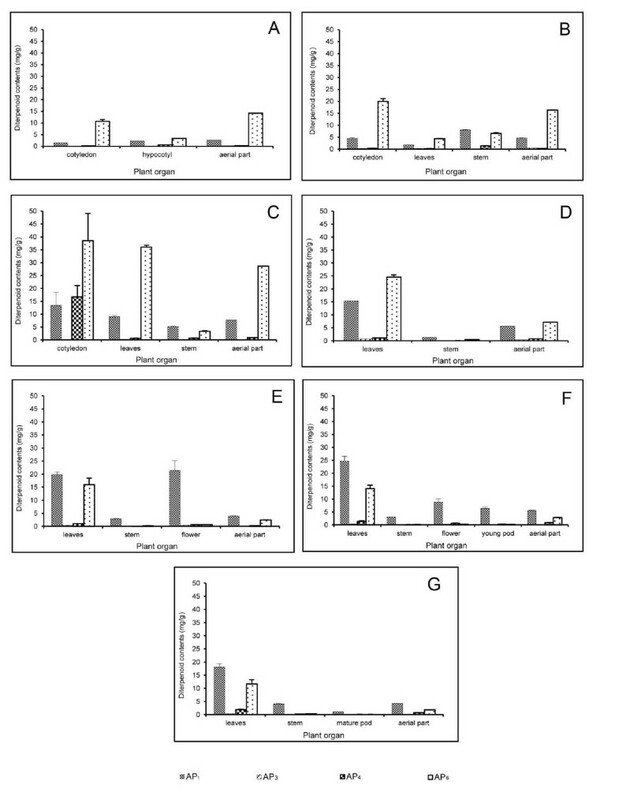 AP4 scavenged free radicals , and showed stronger anti-inflammatory activity than AP1 by inhibiting nitric oxide production both in vitro and ex vivo. AP4 also had antimalarial activities  and hepatoprotective effects against carbon tetrachloride . AP6 is an effective antagonist of platelet activating factor-mediated processes in bovine neutrophils via its effects on calcium channels . It also caused vasorelaxation of rat thoracic aorta  and relaxation of uterine smooth muscle via selectively blocking voltage-operated calcium channels . There is a large market requirement for A. paniculata materials, with an estimated consumption in India (aerial part) of 250 tonnes per year . A. paniculata is now commercially cultivated to meet the high demand . There have been several studies on cultivation of A. paniculata. Kumar et al. reported that 25°C was the optimal germination temperature (94.6% germination), while there was no germination at 40°C. The growth regulators abscisic acid and gibberellic acid also increased the AP1 content . There are few reports on the contents of active diterpenoids in A. paniculata during plant development. Bhan et al. analyzed the contents of three diterpenoids in leaves at three harvesting dates. Prathanturarug et al. investigated the contents of AP1 and AP3 in field-grown A. paniculata harvested at the 60% flowering stage. Parasher et al. reported that the maximum AP1 content in leaves was at 120 days of maturity. There were large variations in the contents of three active diterpenoids (AP1, AP3, and AP4) among different A. paniculata products in a Thai market . Both the growing region and season strongly affect production of the diterpene lactones in this plant . In this study, we developed a simple and rapid extraction method followed by simultaneous determination of the four active diterpenoids (AP1, AP3, AP4, and AP6) in different parts of A. paniculata. This simple reversed-phase HPLC-diode array detector (DAD) method was successfully applied to quantify the major components in A. paniculata at different growth stages. The method is sufficiently rapid, simple, sensitive, and cost-effective to be used for quality control of raw materials and herbal preparations . DAD can be used to identify the active compounds based on their absorption spectra. To our knowledge, there are no reports on the contents of the four active diterpenoids at different growth stages from seedling to mature stages of A. paniculata. In addition, there are few reports on the contents of these four active compounds in various plant organs at different growth stages. The aim of this study was to determine the changes in contents of the four active diterpenoids in various plant organs of A. paniculata at different growth stages in greenhouse and field experiments at two different cultivation times: September 2006 and January 2007. Four standard diterpenoids, andrographolide (AP1, purity 99%), 14-deoxy-11,12-didehydroandrographolide (AP3, purity 96%), neoandrographolide (AP4, purity 99%), and 14-deoxyandrographolide (AP6, purity 99%) were purified at our Institute by the Laboratory of Pharmacology and Laboratory of Natural Products, Chulabhorn Research Institute (CRI), Thailand, following a method published previously . They were extracted from A. paniculata plant materials and identified by thin-layer chromatography (TLC), ultraviolet (UV) spectra, melting point (MP) analysis, infrared (IR) analysis, mass spectrometry (MS), and nuclear magnetic resonance (NMR) spectroscopy. The structures of these four active diterpenoids are shown in Figure 1. HPLC grade methanol and acetonitrile were obtained from Merck (Darmstadt, FR, Germany). High purity water obtained from a Milli-Q water purification system (Millipore, Bedford, MA, USA) was used in these experiments. Structures of four main active diterpenoids in Andrographis paniculata. A. andrographolide (AP1); B. 14-deoxy-11,12-didehydroandrographolide (AP3); C. neoandrographolide (AP4); and D. 14-deoxyandrographolide (AP6). A. paniculata plants were identified by Dr. Wongsatit Chuakul and a voucher specimen was deposited at the Pharmaceutical Botany Mahidol Herbarium, Department of Pharmaceutical Botany, Faculty of Pharmacy, Mahidol University, Bangkok, Thailand (PBM 3760). In the greenhouse experiment, we studied two cultivation times: September 2006 and January 2007. The temperature ranged from 24.2 to 28.5°C and the relative humidity was from 60 to 70% in the greenhouse environment. Seeds were sown in a tray and grown in the greenhouse at CRI. Peat moss soil (Chia Tai, Bangkok, Thailand) was used in the greenhouse experiments (pH 5.5; N-P-K 12-14-24; 0.8 kg/m3). At the seedling, first true leaf, and transfer stages, plants were grown in the tray. At the transfer stage, plants were transplanted into pots to grow on to the mature stages (vegetative, 50% flowering, seed-forming, and mature-seed stages). Plants were harvested at different growth stages and separated into different parts (cotyledon, hypocotyl, leaf, stem, flower, young pod including seed, pod, root, and mature seed) depending on the growth stage (Table 1) to quantify the four active diterpenoids. Plant materials were washed and then dried in an oven at 35–45°C . The dried plant materials were ground into a powder using a blender (Waring Commercial, CT, USA), and kept at room temperature until extraction and analysis. Seeds were sown in the field at Ratchaburi Province, Thailand. Plants were harvested at different growth stages; transfer, vegetative, 50% flowering, seed-forming, and mature-seed stages (2, 3.5, 5, 6, and 6.5 months old, respectively) to quantify the four active diterpenoids. Sun-dried plant materials from the field were separated into two parts (leaves and aerial part). The dried leaves and aerial parts were ground into powder, and kept at room temperature until extraction and analysis. Dried powder (0.1 g) of A. paniculata from different plant organs at different growth stages was accurately weighed (three replicates per sample, 20 plants per replicate at seedling, first true leaf, and transfer stages, two plants per replicate at other maturity stages). The plant powder was extracted with 4 mL methanol and rotated with a rugged rotator (Glas-Col, IN, USA) for 5 min, and then centrifuged (Sorvall, Munich, Germany) at 1876 × g for 10 min. The supernatant was transferred into a 10 mL volumetric flask and the crude powder was re-extracted twice with 3 mL methanol. All extracts were combined, the volume was adjusted, and then the solution was filtered through a 0.45-μm nylon membrane (Chrom Tech, MN, USA) before HPLC analysis. The extraction method was modified from our previous study . Powdered plant material (leaves or aerial part) (0.1 g) of A. paniculata at different growth stages was accurately weighed (three replicates per sample, 20 plants per replicate at transfer stage, two plants per replicate at other maturity stages) and then extracted as described above for the greenhouse experiment. 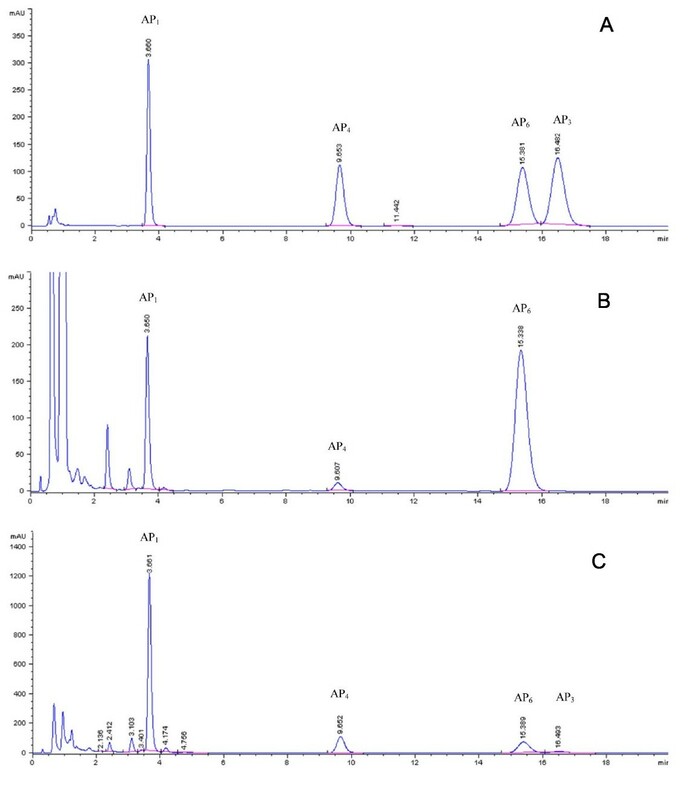 The four compounds in the methanolic extract of A. paniculata were analyzed simultaneously by HPLC-DAD (Agilent Technologies, Germany) on a reverse phase column (Zorbax SB-C18; 4.6 × 75 mm, 3.5 μm) connected to a cartridge guard column (Agilent Technologies, USA). The simple mobile phase consisted of 28% acetonitrile in water with a flow rate of 1.2 mL/min. The temperature of the column was controlled at 25°C and the detection with the diode array detector (DAD; Model G1315A, Agilent Technologies, Germany) at 205 nm. The injection volume was 5 μL. A standard mixture containing AP1, AP3, AP4, and AP6 in methanol was prepared in the range of 0.5–1000 μg/mL. The peak area of each compound was plotted against the concentration. Data are expressed as mean ± standard deviation (SD, n = 3). Linear regression analysis was used to compare DAD responses and concentrations using ChemStation software version A.10.02 (Agilent Technologies, Germany). Accuracy was accessed as percentage recovery using the following formula: . Precision was expressed as the percent relative standard deviation; %RSD , which was calculated with Excel 2010 software (Microsoft, USA). Xu et al. determined diterpenoids in A. paniculata leaves by silver ion complexation in the mobile phase to separate AP3 and AP6 with a 25-min analysis time. The analysis time in the present study was less than 18 min. The chromatograms in Figure 2 showed good separation of these four active diterpenoids; a chromatogram of the standard solution is shown, compared with samples containing the highest contents of AP6 and AP1 at the transfer and mature-seed stages, respectively. The calibration curves showed good linearity in the range of 0.5 to 1000 μg/mL, and the correlation coefficients were 0.9999 for AP1, AP3, AP4, and AP6. Accuracy was determined (expressed as percentage recovery) by adding three known amounts of standard solutions to the plant samples, 10 replicates per concentration, and then extracting the samples and analyzing by the HPLC method described above. The mean recoveries of the four active diterpenoids, AP1, AP3, AP4, and AP6, were 99.66 ± 2.22%, 98.91 ± 2.29%, 100.20 ± 1.85%, and 97.98 ± 1.90%, respectively, indicating good accuracy of the method. To access the precision of the method, we analyzed the extracted sample solutions 10 times on the same day and 10 times on 3 consecutive days. The results showed acceptable intra- and inter-day precision, as represented by the percent relative standard deviation (%RSD) ranging from 0.80% to 1.02% (content) and from 0.41% to 0.66% (retention time) for intra-day precision, and from 3.42% to 4.92% (content) and from 0.39% to 0.74% (retention time) for inter-day precision. The limit of detection (LOD) and limit of quantitation (LOQ) were measured based on the signal to noise ratio of 3:1 and 10:1, respectively. The LOD of AP1, AP3, AP4, and AP6 were 0.10, 0.25, 0.25, and 0.25 μg/mL, respectively, and the LOQ were 0.25, 0.5, 0.5, and 0.5 μg/mL, respectively. These results showed that our analytical method met acceptable criteria for all analytes, and could be used for routine analysis for the four active diterpenoids in A. paniculata. HPLC chromatograms of four diterpenoids in Andrographis paniculata. A. Four standard diterpenoids; B. Leaf sample of Andrographis paniculata at transfer stage; and C. Leaf sample of Andrographis paniculata at mature-seed stage. There were large variations in contents of the four active diterpenoids in different plant organs at different growth stages. 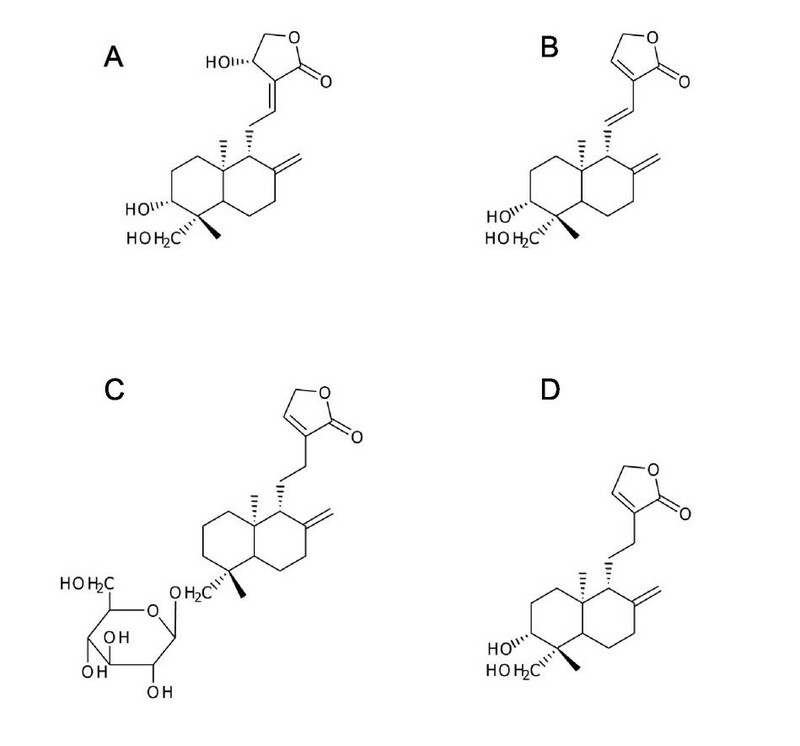 We studied the patterns of accumulation of these four active diterpenoids in two cultivation periods: September 2006 (Figure 3) and January 2007 (Figure 4). The contents of four active diterpenoids in seeds and roots of A. paniculata were lower than limit of detection (LOD). From the seedling to the first true leaf stages, the highest content of AP6 was in the cotyledons (Figure 3A and B). At the transfer stage, the highest content of AP6 was in leaves both in 2006 and 2007 (28.02 ± 0.15 and 36.05 ± 0.69 mg/g, respectively; Figures 3C and 4C). In 2006, the highest content of AP1 was in leaves at the mature-seed stage (24.02 ± 1.18 mg/g) (Figure 3G), whereas in 2007, the highest content of AP1 was at the seed-forming stage (24.72 ± 1.89 mg/g) (Figure 4F). Flowers at the 50% flowering stage also contained high contents of AP1 in both 2006 and 2007 (21.82 ± 1.61 and 21.42 ± 3.74 mg/g, respectively) (Figures 3E and 4E). In contrast, flowers contained low contents of the other three active diterpenoids (≤ 0.9 mg/g). There were low levels of AP3 in all plant organs at all growth stages (≤ 1.4 mg/g). The highest AP3 content was at the mature-seed stage in 2006 (1.4 ± 0.12 mg/g) and at the vegetative stage in 2007 (0.77 ± 0.09 mg/g) (Figures 3G and 4D). 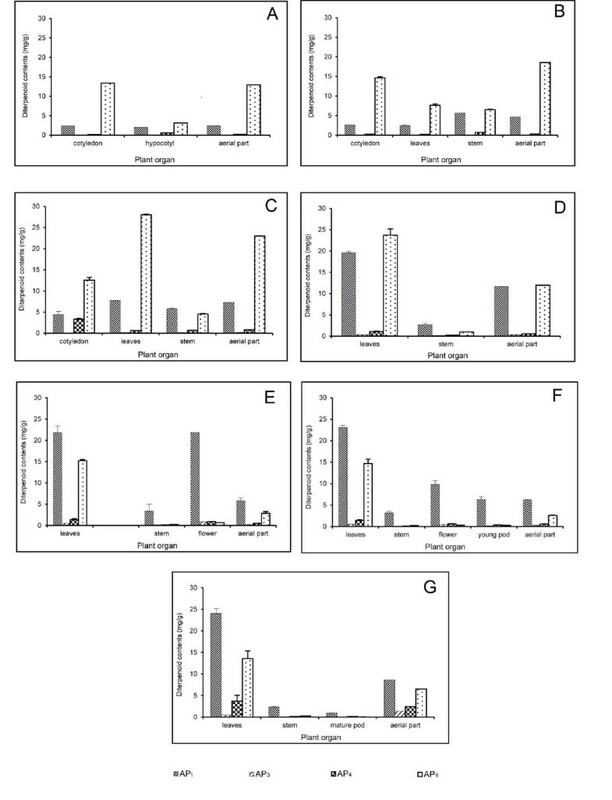 The highest content of AP4 was in cotyledons at the transfer stage in 2006 and 2007 (3.28 ± 0.23 and 16.65 ± 4.48 mg/g, respectively) (Figures 3C and 4C). The range of AP4 in leaves was from 0.22 mg/g to 3.72 mg/g and the content increased as plants matured. The highest content of AP4 in leaves was at the mature-seed stage in 2006 and 2007 (3.72 ± 1.31 and 1.88 ± 0.15 mg/g, respectively) (Figures 3G and 4G). The AP6 content in leaves was lower in 2006 (28.02 ± 0.15 mg/g) than in 2007 (36.05 ± 0.69 mg/g), while the contents of the other three active diterpenoids were similar in both cultivation times. The present results also indicated that the young plants at seedling and first true leaf stages (harvesting time ≤ 14 days) contained high contents of these four active diterpenoids. Contents of four diterpenoids in various tissues of Andrographis paniculata at different growth stages (A–G) in greenhouse experiment (September 2006). Stages were as follows: A. Seedling (7 days); B. First true leaf (14 days); C. Transfer (39 days); D. Vegetative (108 days); E. 50% Flowering (128 days); F. Seed-forming (133 days); and G. Mature seed (161 days). Contents of four diterpenoids in various tissues of Andrographis paniculata at different growth stages (A–G) in greenhouse experiment (January 2007). Stages were as follows: A. Seedling (7 days); B. First true leaf (14 days); C. Transfer (45 days); D. Vegetative (114 days); E. 50% Flowering (141 days); F. Seed-forming (149 days); and G. Mature seed (206 days). In greenhouse and field experiments, the changes in the contents of the four active diterpenoids at different growth stages were similar in leaves and the aerial part (Figures 5 and 6). However, leaves contained higher contents of four active diterpenoids than the aerial part. In the greenhouse experiment, the highest AP1 content in leaves (24.02 ± 1.18 mg/g) was about three times higher than that in the aerial part (8.64 ± 0.25 mg/g) at the mature-seed stage in 2006 (Figures 5A and 6A). Similarly, in 2007, the highest AP1 content in leaves was four times higher than that in the aerial part at the seed-forming stage (24.72 ± 1.89 mg/g in leaves, 5.71 ± 0.65 mg/g in aerial part) (Figures 5B and 6B). In the field experiment, the highest AP1 content in leaves was only twice that in the aerial part at the vegetative stage (43.16 ± 0.92 mg/g in leaves, 24.31 ± 1.68 mg/g in aerial part; Figures 5C and 6C). In greenhouse (2006 and 2007) and field experiments, there was a drastic increase of AP1 in leaves from the transfer stage (7.78 ± 0.03, 9.09 ± 0.47, and 18.43 ± 0.54 mg/g, respectively) to the vegetative stage (19.61 ± 0.28, 15.39 ± 0.06, and 43.16 ± 0.92 mg/g, respectively; Figure 5). In the field experiment, the highest content of AP1 was at the early growth stage (vegetative stage) whereas it was at the mature-seed and seed-forming stages in the greenhouse experiment in 2006 and 2007, respectively. The highest content of AP6 in leaves was at the transfer stage in the field experiment (30.59 ± 1.39 mg/g) (Figure 5C) and in the greenhouse experiment (28.02 ± 0.15 and 36.05 ± 0.69 mg/g in 2006 and 2007, respectively) (Figure 5A, 5B). In the greenhouse experiment, the AP6 content in leaves and the aerial part increased markedly from the first true leaf to the transfer stages and then decreased at maturity. The pattern of AP6 accumulation in plants was similar in the field and greenhouse experiments (Figures 5 and 6). Moreover, there were low levels of AP3 and AP4 in leaves and the aerial part at all growth stages in both the greenhouse and field experiments. A. paniculata grown in field conditions contained higher levels of the four active diterpenoids than plants grown in greenhouse conditions. 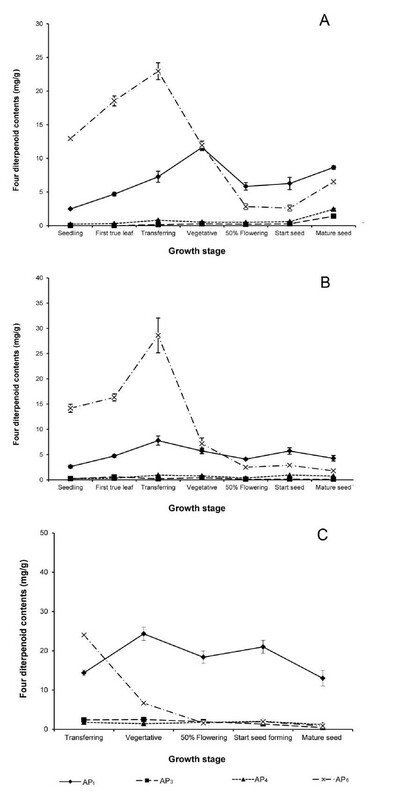 For example, AP1 contents in leaves at all growth stages (transfer to mature-seed stages) were higher in field-grown plants than in greenhouse-grown plants. Because A. paniculata was grown under natural conditions in the field experiment, it is difficult to control cultivation conditions that may affect the levels of these active diterpenoids and quality of this medicinal plant. However, these results showed that the pattern of accumulation of the four active diterpenoids was similar in the field and greenhouse experiments. Contents of four diterpenoids in Andrographis paniculata leaves at different growth stages. A. Greenhouse experiment (September 2006); B. Greenhouse experiment (January 2007); C. Field experiment. Contents of four diterpenoids in Andrographis paniculata aerial part at different growth stages. A. Greenhouse experiment (September 2006); B. Greenhouse experiment (January 2007); C. Field experiment. To our knowledge, this is the first report to evaluate the contents of these four active diterpenoids in different plant organs during plant development in greenhouse and field experiments. A. paniculata is normally harvested at the 50-60% flowering stage, since it was proposed that plants at this stage contain the highest levels of AP1[22, 23]. Among the active compounds extracted from A. paniculata, AP1 is generally reported as the major active compound . Matsuda et al. analyzed whole A. paniculata plants and reported the following diterpenoids contents on a dry weight basis: AP1 (0.6%), AP3 (0.06%), AP4 (0.005%), and AP6 (0.02%). Sharma et al. reported that the leaves of A. paniculata contained the highest content of AP1 (2.39%), similar to our results (2.4%) in 2006 and 2007 in the greenhouse experiment. However, the highest content of AP1 in our field experiment (4.3%) was higher than that reported previously. A new finding in our study was that the most abundant diterpenoid was not AP1 but AP6 (in 2006 and 2007 at the seedling to vegetative stages in greenhouse experiments, and at transfer stage in the field experiment). The highest content of AP6 was found in leaves at the transfer stage; it was four times higher than AP1 in 2006 (28.02 ± 0.15 and 7.78 ± 0.03 mg/g, respectively) and 2007 (36.05 ± 0.69 and 9.09 ± 0.47 mg/g, respectively). A. paniculata at the transfer stage with short harvesting time (39–45 days) contained the highest level of AP6, which showed bioactivity as an effective vasorelaxant . Since the four active diterpenoids of A. paniculata have different pharmacological properties, knowledge of their different patterns of accumulation among various plant organs and growth stages will be helpful to select plant materials for particular purposes or disease treatments. 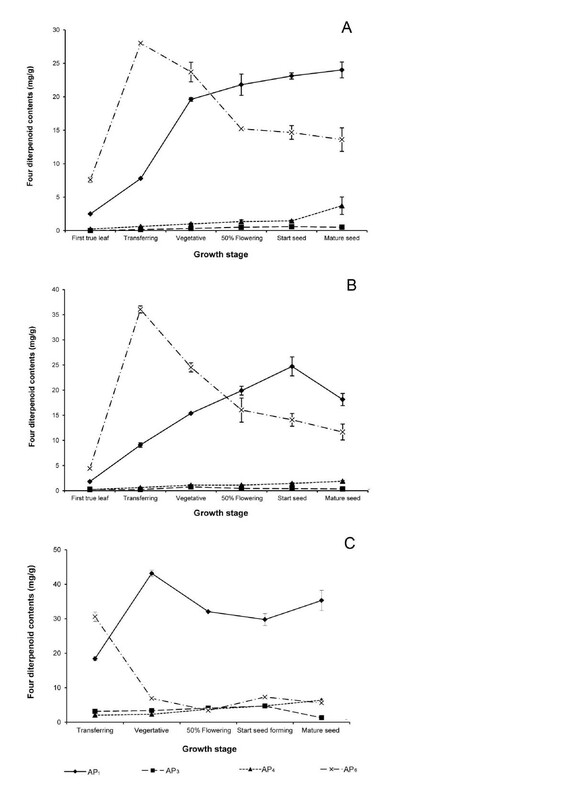 The patterns of accumulation of AP1 and AP6 were similar to those reported by Bhan et al.. AP1 was continuously produced during plant growth while AP6 content in leaves peaked at the transfer stage and then decreased as the plants matured. In a previous report, harvesting at 100 days after transplantation was recommended to obtain plants with the highest AP1 content . Prathanturarug et al. reported levels of AP1 and AP3 similar to those detected at 50% flowering stage in the present study, although the A. paniculata plants were harvested at the 60% flowering stage in their study. Recently, Parasher et al. analyzed the AP1 content in leaves at different growth stages, and found the highest levels of AP1 in leaves at 120 days of maturity, similar to our results (highest AP1 content was in leaves at mature-seed and seed-forming stages). The content of AP3 was lower than that of other diterpenoids in these experiments. However, in our previous study, we observed that the AP3 increased in plants and plant products stored for a period of time . Furthermore, the stability of the amorphous form of AP1 was temperature-dependent, and it could be converted to AP3. Fresh mature plants with low AP3 content and high AP1 content should be used to treat the common cold, rather than products that have been stored for a period of time, which may exert cardiovascular side effects . The highest content of AP4 was at the transfer stage, similar to AP6, but in cotyledons rather than leaves. The AP4 content in leaves reported in this study was low and slightly increased with maturity. Bhan et al. reported that the simultaneous dehydration and glycosylation of AP1 formed andrographoside and AP4. However, the AP4 content in our study was lower than that reported in their study, which may be because of genetic variations and/or cultivation conditions. The authors kindly acknowledge Mr. Likhit Suchikran for providing seed materials and for assistance with the field experiment. We also thank Mrs. Sujunya Rueangveerayut, Laboratory of Biotechnology, CRI, for assistance with greenhouse experiments. JS conceived the idea for the study. JS, NR, and NP designed the experiments. NP and NR performed the experiments. NP analyzed the data. JSH cultivated plants in the greenhouse experiment and conducted extractions. SR separated, purified, and identified the four diterpenoids reference standards. NP, NR, and JS wrote the manuscript. All authors read and approved the final version of the manuscript.